Rumaki is a popular party appetizer that probably originated in Polynesian restaurants. The rumaki goes back to the mid 20th century; one of the first known print references was, purportedly, on the 1941 menu of the restaurant, Don the Beachcomber. Rumaki appetizers are typically put together with marinated chicken livers, water chestnuts, and bacon. The wrapped chicken livers are marinated in an easy mixture of soy sauce and spices, and then they are. Feel free to use whole unsliced chicken livers. Don't like chicken livers? Take a look at the possible variations below the recipe. Heat the oven to 375 F. Line a large rimmed baking sheet with foil and place a rack in the pan. Cut the bacon in half crosswise and arrange the strips on the rack. Remove the bacon to a cooling rack and pat gently with paper towels. Put the pan with the rack aside for the rumaki. While the bacon is cooking, cut the chicken livers into 3/4-inch pieces. Put the chicken liver pieces in a bowl and add the drained water chestnuts, soy sauce, ginger, curry powder, brown sugar, salt, and pepper. Set aside to marinate for about 15 to 20 minutes while the bacon cooks. When the bacon is cool enough to handle, place a strip on a work surface. Place a piece of chicken liver on the top of the bacon and a slice of water chestnut just below it. Roll the bacon up tightly and secure with a toothpick. Ensure the toothpick goes through the water chestnut, the chicken liver, and the ends of the bacon. Place the rolled rumaki on the rack and repeat the assembly with the remaining bacon, livers, and water chestnuts. Strain the marinade into a saucepan and bring to a full rolling boil. Remove from the heat and set aside. Bake the rumaki for about 20 minutes or until the bacon is crisp, turning halfway through the cooking time and basting occasionally with the boiled marinade. Discard the remaining marinade and transfer the rumaki to a bowl for serving. Or, if not serving immediately, keep the rumaki warm on a warming tray or in a slow cooker (on the warm or low setting). Replace the chicken livers with large sea scallops sliced in half horizontally. Replace the chicken livers with pineapple chunks. 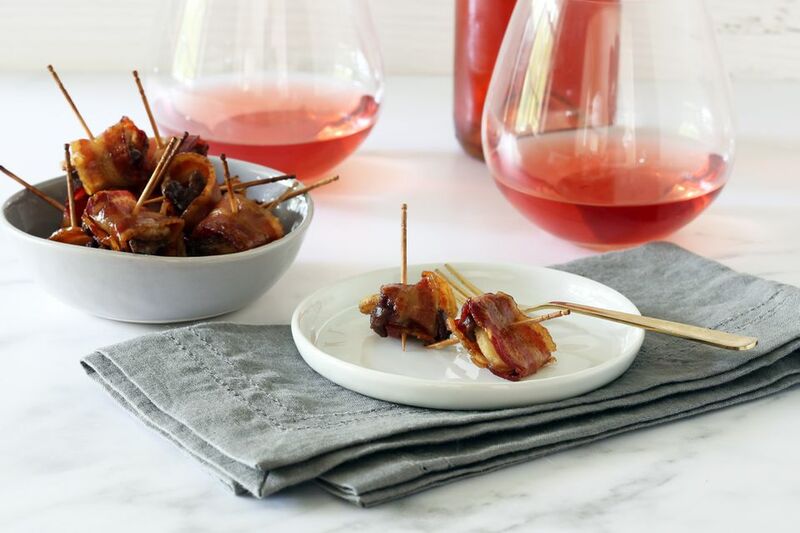 Wrap a sliced water chestnut and pineapple chunk in bacon. Marinate and cook as directed, or until the bacon is crisp.